In addition to the ADSC EXPO 2012 earlier in March (see post here), the annual Geo-Institute meeting for 2012, GeoCongress 2012 , was held later in the month in Oakland, California. 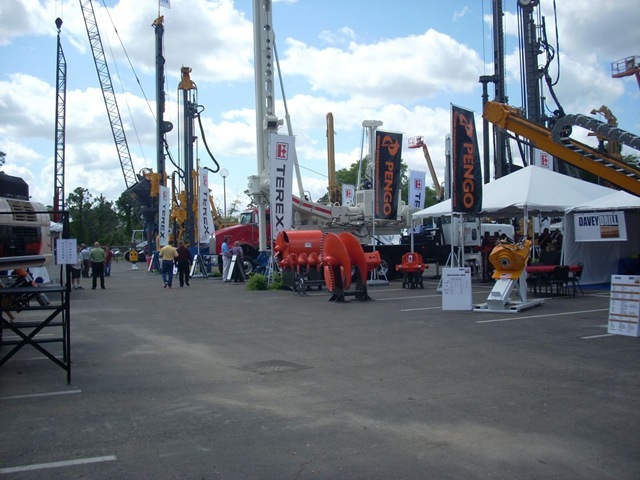 The conference featured a very large technical program with a variety of tracks covering geotechnical engineering topics. There were also the annual named lectures (Terzaghi, Peck, etc.) and other special events. Randy Post wrote about his time at the GeoCongress at his blog, GeoPrac.net. Check out all of his posts on the conference, including photos and video. A key feature of this congress was the State of the Art (SOA) and State of the Practice (SOP) Lectures given throughout the four days. Thirty prominent engineers were invited to give the SOA/SOP lectures. 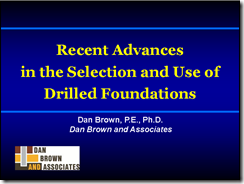 Dan gave one of the SOP lectures with his highlighting advances in drilled foundation use and selection. His paper, along with all of the other SOA/SOP lectures, is included in GSP No. 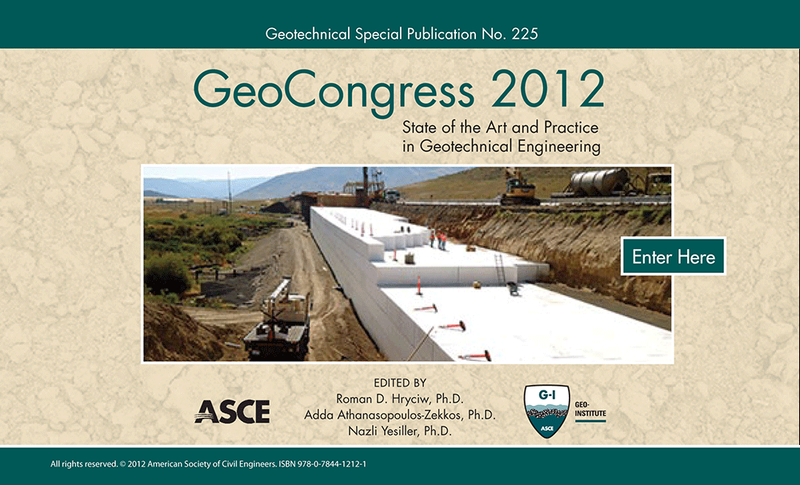 226, Geotechnical Engineering State of the Art and Practice, Keynote Lectures from GeoCongress 2012. His presentation is linked on the image below. Turner, J.P., Duffy, J.D., Buell, R. and Zheng, X (2012). “Foundations for the Bridge at Pitkins Curve”, GeoCongress 2012 State of the Art and Practice in Geotechnical Engineering, Geotechnical Special Publication No. 225, ASCE, pp414-423. A technical note by Tim that appeared in the December 2010 issue of the DFI Journal has been added to our publications page. Tim’s note examines some issues related to axial load testing of augered cast-in-place (ACIP) piles, also know as augercast piles or CFA piles, that are not covered in ASTM D 1143/D 1143M-07 Standard Test Methods for Deep Foundations Under Static Axial Compression. Specifically, load hold time, unload-reload cycles, and fluctuations in incremental load are discussed as they relate to load testing for determining axial capacity or axial load distribution of ACIP piles. Details of instrumented ACIP pile load testing are also covered. Siegel, T.C. (2010). 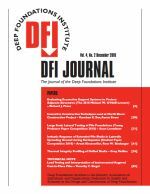 “Load Testing and Interpretation of Instrumented Augered Cast-in-Place Piles”, DFI Journal Volume 4, No. 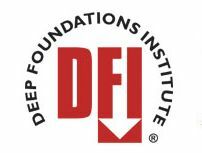 2, December 2010, Deep Foundations Institute, pp69-71. The information in the following article is a composite of material that came to Foundation Drilling Magazine from three separate sources. Part I is based on information gleaned from an article that was published on the Associated Press news wire. 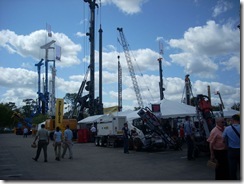 Part II is excerpted from ENR’s August 18th, E-Newsletter. Part III was provided by Paul Axtell and Dan Brown of ADSC Technical Affiliate company, Dan Brown and Associates. The bridge project is of interest in general. The Osterberg Load Cell test will be of particular interest to professionals in the deep foundation industry, and specifically for those who work in the drilled shaft segment. Axtell, P.J. (2010). “Mississippi River Bridge Project Includes Record Load Test: A Three Part Story”, Foundation Drilling, Vol. 31, No. 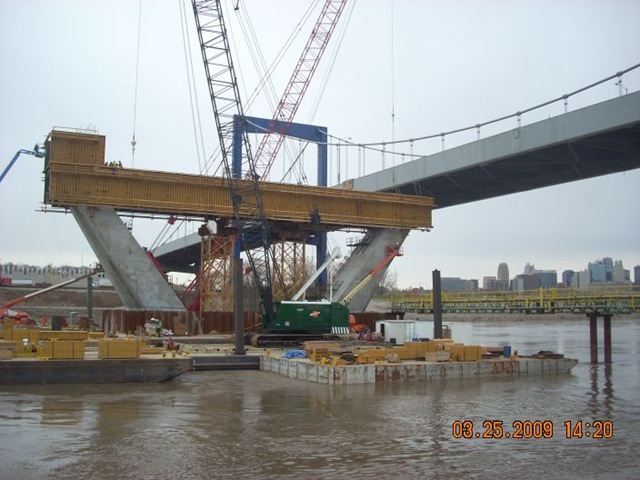 7 September/October 2010.
kcICON Bond Bridge Update – Drilled Shafts Complete! UPDATE (5/19/09): Here is an article the Kansas City Star on-line. It has links to photos and video. Work by DBA is all but compete on the kcICON project. All drilled shafts have been installed and base grouted. Construction of the shafts went very well, with no significant issues. 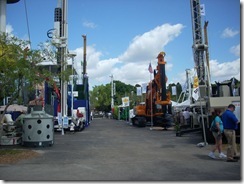 Hayes Drilling installed all of the land-based shafts. AFT performed all of the base grouting. The main pylon in the river continues to take shape. It won’t be long before PCC will have it looking like a bridge! Paul has been “enjoying” observing drilled shafts at night and base grouting during the day. A collection of some of his photos from the last bits of shaft construction are below. He got some great shots of the pylon, including some out in the river. 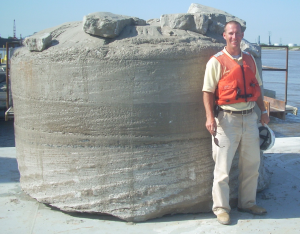 I had the pleasure of making two trips to the Audubon Bridge site in April to help Steve. I got to observe the excavation of two of the shafts on the West High Approach (on land! ), observe base grouting of some of the West High Approach shafts, and base grouting of the test shaft on the East High Approach. While there, I got to see both of the river pier cofferdams. 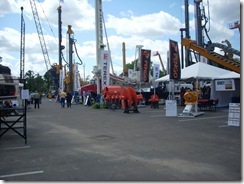 They were something else to see with all of the bracing and sheet piles. I did not get to see them installed, but I understand it was quite an interesting process as the cofferdams were “jacked down” into place. While I was there, they were cutting of the permanent casing that sticks up above the seal slab of the pier. As usual, some pictures from this trip are below. While not as current, the project web site has a photo gallery with interesting photos, including from the high water of April, 2008. Updated – GEC No. 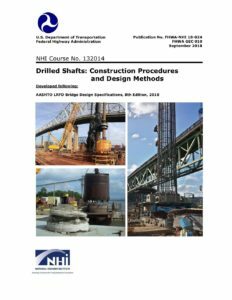 8: Design and Construction of Continuous Flight Auger Piles – It’s Finally Here! 11/30-07 Update! – GEC No. 8 is now up on the FHWA web site. You can download it here. Yes, folks, GEC 8 is finally complete! The publication version of Geotechnical Engineering Circular No.8: Design and Construction of Continuous Flight Auger Piles will soon be available from the FHWA Geotechnical Web Site. If you want an official sneak peek at GEC 8, just click here to get the PDF (approx. 10 MB). 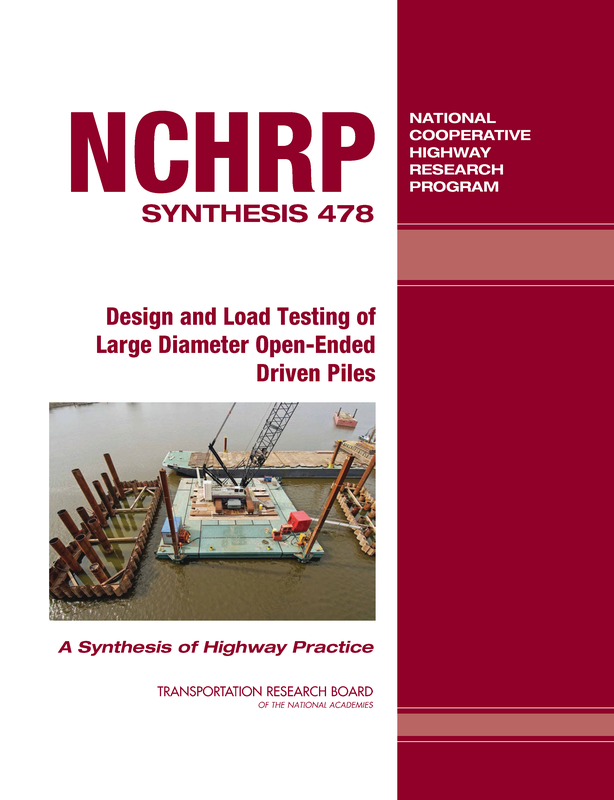 This circular is part of FHWA’s efforts to implement the use of CFA piles as a viable foundation alternative for transportation structures. We’ll post a notice when GEC 8 is on the FHWA web site. 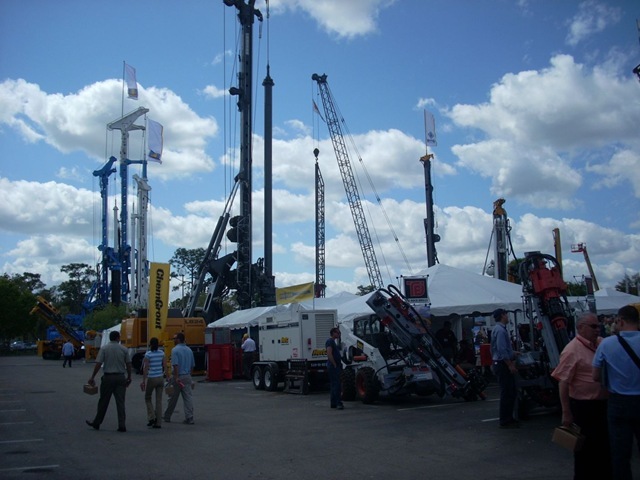 A preliminary call for papers has been released for the International Foundation Congress and Equipment Expo 2009 (IFCEE ’09) to be held in Orlando, Florida March 15-19, 2009. 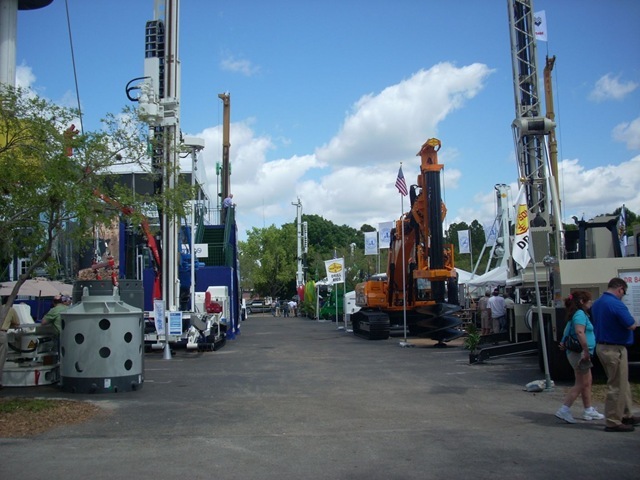 The meeting is a joint venture of The Geo-Institute of ASCE (GI), The International Association of Foundation Drilling (ADSC) and The Pile Driving Contractors Association (PDCA). Information about the call for papers is here. 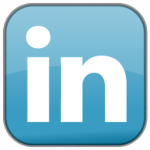 I’ll have links to the conference web site once it is up and running, as well as blogging additionla information when available. This promises to be a great conference much like the 2004 Geo-Support Conference.